Fifth grade at BASIS Independent presents students with the special opportunity of getting a fantastic "jump start" on middle school. The accelerated, rigorous 5th grade curriculum caters to all different types of learners, making it an attractive program to parents and students alike. Guided by passionate Subject Expert Teachers, 5th grade students learn the foundation of our rich, STEM-focused, liberal arts BASIS.ed curriculum, which is utilized in some of the very best schools both nationally and globally. BASIS Independent 5th graders are not only on the path to advanced academics, but are also developing a deep love of learning that will last them a lifetime. We're often asked what a typical day in 5th grade looks like at BASIS Independent. 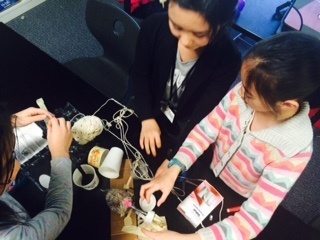 Today we get a glimpse into the 5th grade experience at our grades 5-12 sister school BASIS Independent Silicon Valley, courtesy of an administrator who was able to spend the day shadowing the students. 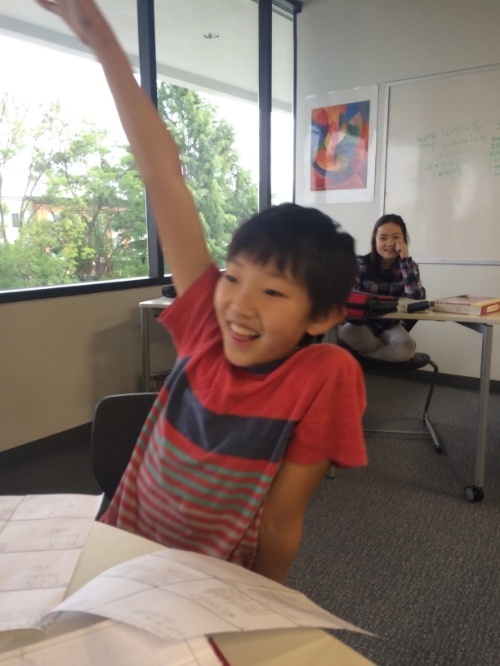 Upon asking many of our students what life is like as a 5th grader at BASIS Independent Silicon Valley, I often heard a powerful two-word answer: “It’s awesome!” Recently, I decided to try 5th grade out for myself. Though I realized I may not be smarter than one of our 5th graders, I can say with complete confidence - 5th grade really is awesome. 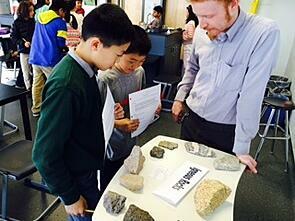 Recently, I took advantage of a welcomed day-long opportunity to observe all-things 5th grade. Keep reading for highlights of my day. My day began in Physical Geography with Mr. Ryan. The first class of 5th graders had spent the week going in-depth on rock cycles, so this was the day they were conducting demonstrations. Excitement was in the air as students were simulating the unique rock cycles and rock formations, “replicating the randomness of nature with the roll of a die, only after which students could move to the next formation,” as Mr. Ryan described. Seeing how students were eager, physically active participants in their learning was really great - I could practically see them absorbing it. Next, it was time for a BASIS Independent favorite: Math. I had the pleasure of speaking with bright-eyed student Brandon H. from Mr. Davison's math class. He made it abundantly clear that he enjoyed math class, "Mr. Davison makes it fun to learn! He makes everything simple and gives clear explanations. This school year I have learned how to multiply and divide fractions. Plus, this summer I will be taking the math placement test to jump into Algebra I for next school year!" Though our program is academically rigorous, students find time to relax and hang out. At lunch in particular, students were able to open up and candidly share what they love about their school. Katarina C. shared, “I’ve made so many friends here, and I love seeing them every day.” Student Shreya likes in particular that she can pick her foreign language, though she admits she “really likes all of my classes.” Per student Shinjan, “I can ask more questions here. I am much more advanced in math and have teachers with different perspectives. Teacher office hours are also really good.” All students were excited to have 7 different classes, which is a new experience for all students I spoke with. After lunch, I settled into Dr. Jensen’s English class where once again, I witnessed students who were enthusiastic, inquisitive and energetic. I didn’t have the opportunity to talk to anyone because the students were busy collaborating in groups developing their own short skits based off scenes in the book, Where the Red Fern Grows by Wilson Rawls. 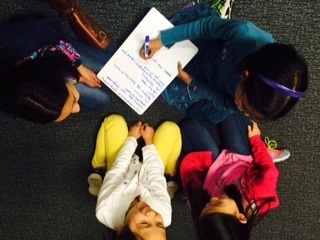 Seeing the way the students work together, helping and encouraging each other along the way was truly inspiring. That inspiration spilled over into my last class of the day: Introduction to Science with Ms. Hagopian. 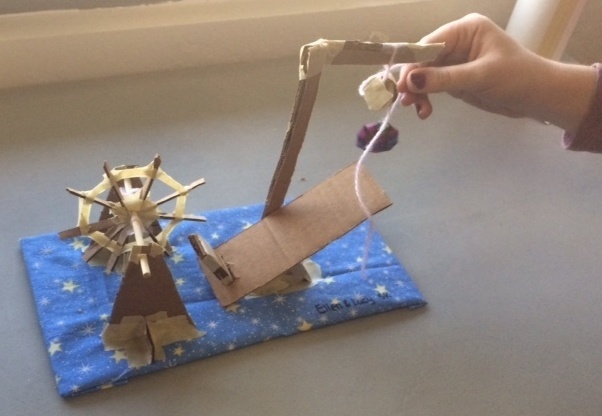 Students were busy finalizing their complex machine building. My favorite part of the class was observing students working cooperatively and watching them celebrate together their successes when they configured their machine to complete the task they desired. Then something amazing happened - when class ended, there was a universal student groan and some thematic ‘Aw, but I don’t want to leave!’ diatribes. As the day came to a close, it became apparent that not only are students held to high academic standards and are taught an accelerated STEM-focused Liberal Arts curriculum by Subject Experts, but also quite simply, they love learning and hence, love school. There was a noticeable common thread amongst the various classes and subjects – student involvement. By putting into practice the lessons learned, students aren’t just memorizing and transposing information onto an exam. Are you interested in becoming a BASIS Independent Fremont 5th grader for the 2016-2017 school year? Don't miss this invaluable opportunity to join one of the best schools in America. Join us at an upcoming informational event or simply apply now!